I feel a little shell-shocked. It's been a long time since a story has captured me so completely as this one. I picked it up two days ago. A massive dollop of Real Life Happening stopped me devouring the whole book in one sitting. Even so, it came with me everywhere, pages turned in sneaked glances, whenever I had a minute to read another few paragraphs. 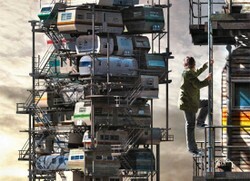 'Ready Player One' is Ernest Cline's first novel. For the love of all that is good and holy, don't let it be his last! A page turning tale of epic proportions told through the claustrophobic world view of a single character aiming as high as he can reach. If you've ever loved '80s pop culture, you will love this book. You will also fall head over heels with it if you have any interest in gaming, cyberpunk, dystopian worlds, human rights, media manipulation, corporate attempts to monetize the whole damn world, 1% v the 99%, hacker ethics, copyright issues and good, old, rip roaring, page turning stories. Needless to say, I was entranced from the word go. I was sent Ready Player One by a friend's mother, who had already devoured its content. Having now followed her through the pages, I can understand her evangelism on the subject. I'm right there with her, telling everyone, telling you. This is a blooming good book. It's a story you won't want to leave. The first thing I did upon finishing - other than exhaling a heart-felt 'wow' and staring into space for a fair few minutes - was to scramble towards my keyboard, hunting the internet for a sequel. There shall and must be a sequel. I can't not be in that world, now I know it exists! But there is nothing more. 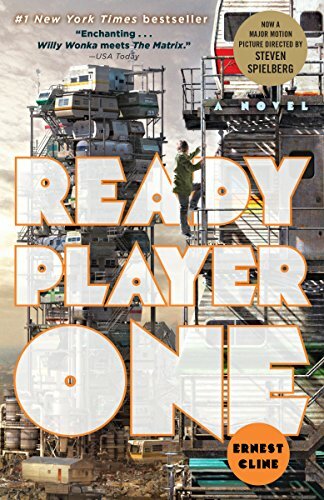 Author Ernest Cline gave us Ready Player One, a beautifully self-contained tale with no threads left hanging, but nothing else in the same universe. That's an error. Consider this an open plea to Mr Cline - MORE MORE MORE! On the bright side, Ready Player One is in the progress of being turned into a movie. Read it now, so you're ahead of the game; already knowing all about it before theater going audience think that they discovered it first. Be that cool. I've been unpicking further layers of meaning in the plot for days, as my mind can't leave this storyline alone. Nevertheless, I'll give you a synopsis of 'Ready Player One'. Wade Watts lives in The Stacks, on the outskirts of Oklahoma City, in the year 2044. A generation before, this would have been a trailer park, but the world has changed and space alongside cities is at a premium. Trailers are no longer in nice neat rows. They are piled up in tottering towers, platform by platform, scaffolding searing the skies. These are The Stacks, amongst the poorest residences in a poverty stricken world. Reality isn't fabulous in The Stacks, nor is it particularly wonderful anywhere else. Humanity used up all of the oil and you'd be amazed how much global infrastructure relied upon that natural resource. As cities and civilizations fell under the pressure, dispossession, dislocation and war became the name of the game. Actually no. The Game was called The Oasis. It was the one shining light in the lives of most people, no matter where they lived in the world. A virtual reality which fully immersed its players into a universe where everything was possible. People played there. People worked there. People frequently spent the greatest portion of their lives inside its better-than-life digital environs. As a high school student, Wade goes to school there. The Oasis made its inventor James Halliday the richest, most influential person in the world. Then he died. All that power and wealth was suddenly up for grabs, with very predictable results thwarted by the man himself. Ready Player One begins with the announcement of James Halliday's will. A contest - open to all - with his place in the Oasis as the one and only prize. From world leaders to schoolboys in The Stacks, the opportunity and rules were the same. All anyone had to do was find the Easter Egg hidden somewhere in his game. And survive those who would stop at nothing in real life to secure such power for themselves. The models may be adult males, but the 'Ready Player One' shirts are available in a variety of styles and sizes to fit all. It's 2054 and science has FINALLY got round to inventing time machines. Historians no longer have to guess what happened, they can check it out for themselves. Combine science fiction and geek culture with simply great writing and you have the very talented Cory Doctorow. I didn't rest until I'd finished his collection of short stories. Randall Munroe's book of humorously pondered scientific queries was Amazon's Best Book of the Month for September 2014. Any xkcd fan could have seen that one coming. Been on my list for a while now - but not got round to it. You've tipped me over the edge - that one's definitely next. Thank you for inviting me to share your experience. It's all exactly as you said! Though I read the book, not had it narrated. You're making me wonder if I should check that one out now! Woot! Win for the sequel! I've just been haunting Ernest Cline's Twitterfeed though and there's mention of 'Ready Player Two'. *happy dance* Yes! Yes! Yes! That will do very nicely. I've only just started it, and now I've got a few weeks of being really busy with classes so it might be a couple weeks before I really get into it but I'll be letting you know!! I'm fairly convinced too that the book was written with me in mind. Either that or I've found a kindred spirit in the author! Though adding in 90s culture would have made it an even more perfect fit, if such a thing is possible.